✉ The industrial unit beside the mosque, somewhat unexpectedly, houses a professional organ builder. Not the church kind but the fairground type,with pipes on bellows behind a brightly painted front. Two are in situ up front, all painted ribbons and gold trim, one with a central figurine ready to conduct. Alongside is a naked machine in need of further repair, but in full enough fettle to give an enrapturing performance. Kevin the boss stands alongside watching a concertina of yellow card feed through a wooden reader and stack neatly on the floor. The business still employs six people, a lot of the demand coming from Germany and the Low Countries. 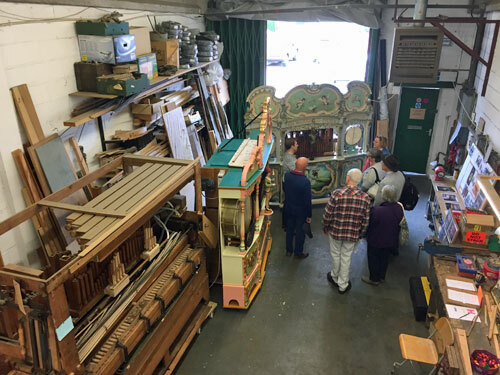 Up on the mezzanine is the music marking department, where three desks are still used for churning out perforated cardboard by hand. The apprentice, who can't be much over 20, explains how he translates sheet music into ruled lines on a strip of brown paper which, once tested, is used to punch tunes which might last for 100 years. Forget digital, he says, this is essentially computer programming anyway. A pattern library of hole-punched music fills the adjacent shelf - "If You Knew Suzie", "Land of Hope & Glory", "Popsy Wopsy", "I'm Happy When I'm Hiking" - and thousands more folded tunes are stored safely in the unit alongside. ✉ "And this was where they kept the hearses. We thought it'd make a nice museum." And they were right. For their latest exhibition, the Friends of Chesham Cemetery's archivist has unearthed an interesting selection of interred souls with a connection to the medical world, ranging from nurses to surgeons. Their stories are told on individual laminated sheets. The next exhibition, on local sportsmen, awaits in a folder on the table. There are, it transpires, no local sportswomen. Alas St Mary's chapel can't be opened because it is technically unsafe. 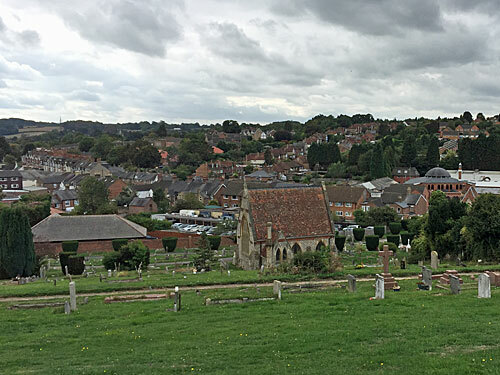 Instead I climb the footpath to the top of the cemetery, where the town reveals itself spread out across the valley below, and find a bench to sit on. The red kites swooping nonchalantly overhead are an astonishing sight, sometimes half a dozen in number, the steepness of the contours encouraging them to glide only a handful of metres above the upper slopes. Somewhere in the distance a fairground organ strikes up. ✉ "I like your mural." The churchwarden takes this as a cue to latch onto me and show me round for ten minutes, for there is much to see. The mural is a 1970s take on Holy Week, the individual scenes envisioned in modern dress like an action comic, and the central hill undeniably the Chilterns near Princes Risborough. 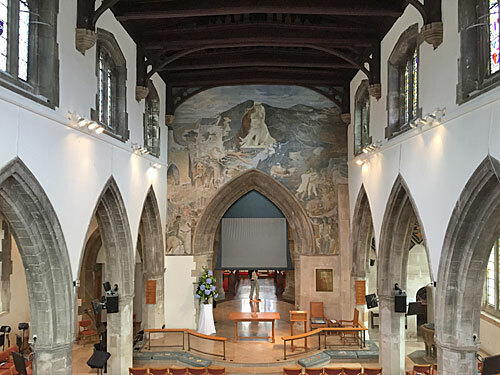 Although the building is properly old, we spend most of our time discussing the 1999 reordering and how they transformed the parish church into a flexible function space. All the pews went, the organ was shifted, a kitchen magically appeared in one corner and there's now underfloor heating. Most modern of all a screen now descends in front of the chancel on which the vicar shows slides during sermons, and all the words of all the hymns appear karaoke-style, which has allowed them to dispose of all their hymn books, Having well-to-do parishioners clearly helps, but St Mary's is a model for how a church can survive, thriving, into a new century. ✉ Although a pink Heritage Open Days sign is displayed prominently on the gate, with balloons, it still feels wrong pushing open the front door and entering someone's empty living room. I make it as far as the kitchen at the rear before being challenged, where Joyce breaks off from her chicken salad and apologises for not paying attention. Apparently I must have tea and cake, it's Fairtrade. I take my Victoria sponge back to the living room where Joyce wants to give me "the full spiel" from carefully prepared notes. Another family arrive and are directed to the comfy sofa, bereft of cake. "We've not got long," they say, but Joyce ploughs on with her extended story of the house regardless. 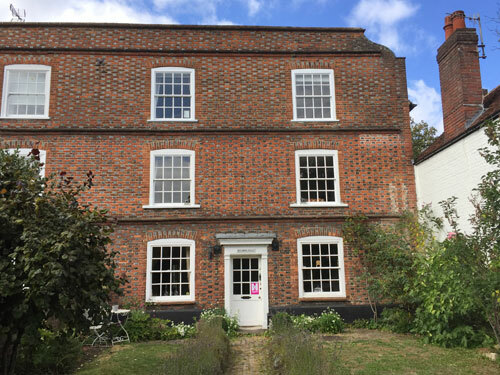 It's quite a tale, involving Elizabethan beams, the reading of the riot act, a boarding school and her family taking ownership of the building rather than allowing it to become offices. "This is a photo of the ghost," she says, handing round a blurry photo from 2004, "although it isn't really." After twenty minutes I have enjoyed my refreshments and a vivid window into the domestic past, and my companion family are itching to politely leave. ✉ The central square around the war memorial is quiet, it being a) Sunday b) a dead end. A single blue Bentley, registration plate DRA60N, pulls up outside the United Reformed Church, but alas it isn't Peter Jones or Deborah Meaden who steps out. 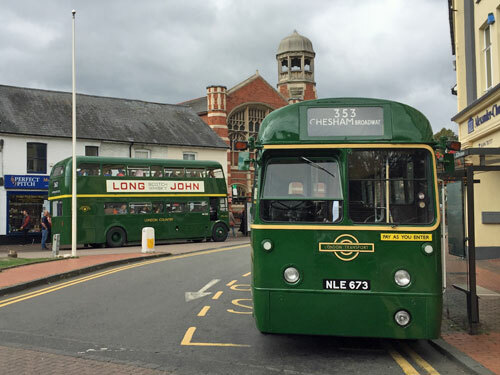 Two lovely old green buses, of the kind which once ran past my front door, are parked up ready to operate a free transfer service to Amersham, where an even more acclaimed Heritage Day is underway. Before long the Routemaster chugs off towards the Water Gardens and climbs through the beechwoods towards Chesham Bois, offering a now-unusual double decker view. A passenger with a curly tache and tweed cap takes a few arty photos reflected in the mirror at the top of the stairs. At Amersham station a massive queue is waiting, keen not have to hike down the hill to Old Amersham. "Yes madam, you will have to fold that pushchair down". The Sun Houses of Highover Park gleam white in the sunshine. A spin down the bypass is required to gain access to the closed-off Broadway. ✉ For one day only, Old Amersham's entire High Street is packed with people, food stalls and dozens of classic cars. The Chesham All Girls Marching Band are performing in Market Square, playing something vaguely recognisable on the glockenspiel. 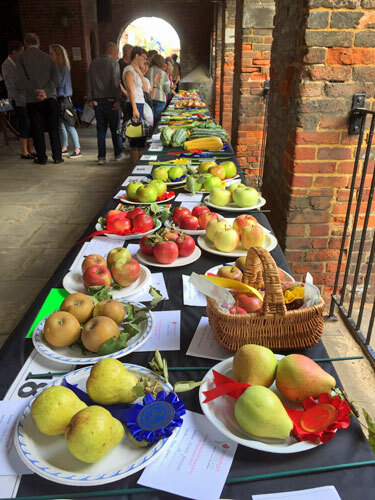 The annual Flower, Fruit and Produce Show has been laid out on trestle tables beneath the Market Hall. Coloured rosettes are dotted amongst the array of apples, courgettes, runner beans, onions et al. Competition has been strongest in the Lemon Drizzle Cake category, where over a dozen exemplars have been sliced, judged and re-clingfilmed. Across in the Memorial Gardens, old ladies stopping indiscriminately to admire the foliage are causing a terrible hold-up on the central footpath. On Church Mead, Mr Punch urges on an audience of rapt children. The Chiltern Traction Engine Club are offering free rides from The Swan down to the end of the funfair. Based on collective facial expressions, the Amersham Rotary Club look a lot more fun to join than the local Masonic Lodge. I decide best come back and look round the revamped museum another day.